Starting GPS Co-ordinates: N51 05' 90" W000 95' 80"
Finishing GPS Co-ordinates: N51 05' 70" W000 96' 40"
This short, unnamed byway (please comment below if you know of a better name for it) starts at the telephone exchange south of Manor House Farm, west of the village of Hawkley. 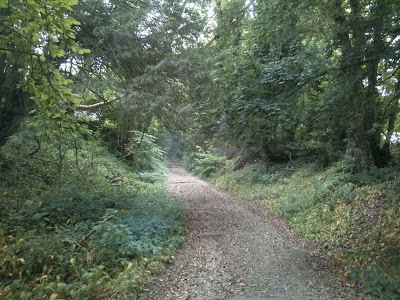 It is a well kept lane: encroaching foliage never poses a problem, the unrutted gravel surface is in good nick and drainage has been taken care of with horizontal 'lips' of wood to divert surface runoff to one side of the byway. You could probably bring a Ford Fiesta up here and get through! The only really noteworthy part of this greenlane is where it rounds a bend and heads uphill on a relatively steep gradient, climbing 39m on the way. It's far from dramatic, but it at least provides a little interest on an otherwise unremarkable, short byway. The track ends on a country road just south of Five Ash Farm. Not really worth the bother of visiting unless you happen to be in the area. To Hampshire County Council this is Byway 20.